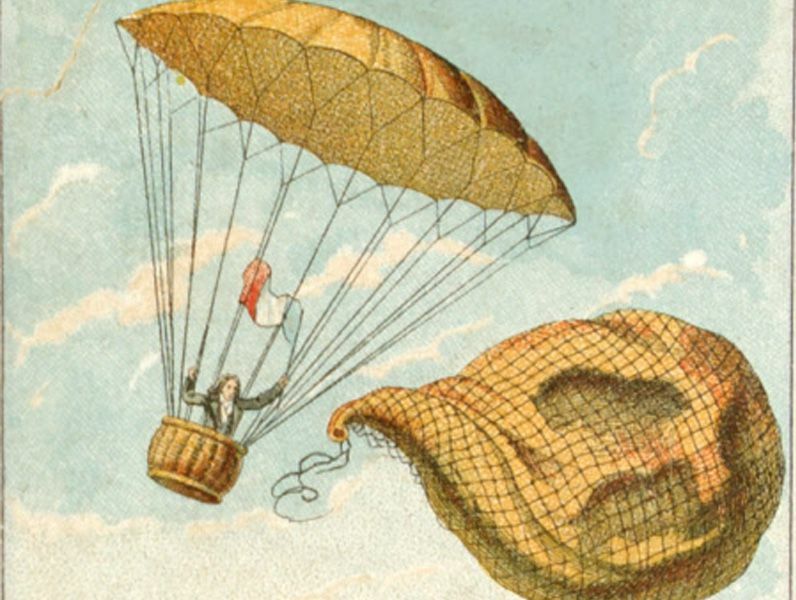 Garnerin took the leap over Paris, in 1797. He made a dreadful lurch in the air that forced a sudden cry of fear from the whole multitude, and made a number of women faint. Meanwhile Citizen Garnerin descended into the plain of Monceau; he mounted his horse upon the spot, and rode back to the park attended by an immense multitude, who gave vent to their admiration for the skill and talent of the young aeronaut. The countless multitude that witnessed his ascent uttered a scream of terror as the Parachute...was seen to fall with the utmost velocity and in a collapsed state. For some moments, feelings of dread and anxiety thrilled every spectator; but the Parachute at length slowly expanded, and hope revived; yet the oscillations of the machine became so violent that the basket, swinging like a pendulum, very frequently appeared to be nearly in a horizontal position with the Parachute. In approaching the earth, the air, from its increasing density, opposed a stronger resistance, and the oscillations proportionally decreased. The intrepid aeronaut reached the ground in a field...His entire descent occupied about ten minutes: he was extremely pale, and the violent rocking he had experienced produced a short sickness, but was not attended by any further inconvenience.